The finest solid oak American slate bed pool table. Choose from a selection of oak tinted finishes. Matching benches & oak veneered dining top available. Manufactured to the finest specifications in France, the Chevillotte Gascogne is both a pool table and a large dining table. Not only will it provide you with a flawless game, it will also seat up to 8 people at dinner time. The slate bed means the table will always lie perfectly flat, and will not warp or slope. The frame is made from solid oak: no laminate, and no compromises. Chevillotte tables are known for their exquisite detailing, and this table is no different. The design is time-honoured, and it lends itself to practically any interior. Games room, dining room, reception room or basement: this is a table that blends form and function effortlessly. Each table is finished with a Simonis cloth top for smooth, unhindered play. We think Simonis is the creme-de-la-creme of pool table fabrics, and you'll notice the difference compared to entry level tables. It comes with a bench, and the manufacturer ships it in a range of different finishes so you can match it with your existing furnishings at home. Need something that ticks all the boxes? The Gascogne is the brand's flagship table, and it could be the table you've been looking for since you first picked up a cue. Traditionally designed American pool table. Available in 7ft or 8ft. Hand crafted from the finest PEFC Certified solid oak wood. Available tinted Oak finishes include Natural, Golden, Medium, Dark, Raw & Limed. The finest Simonis cloth - available in a large range of colours. High quality 20mm diamond honed slate bed. Competition quality rubber cushions - glued to the under-rail for maximum durability & provide outstanding ball bounce. Optional table sights - black, white or diamond shaped. Matching high quality Oak veneered dining top. Leg levellers - provide stability & a perfectly flat playing surface. Unique serial number recorded for each table. Branded with the world renowned Chevillotte logo. Includes a 10 year manufacturing warranty. 2 x 57-inch Chevillotte cues with a 13mm tip. 1 x set of 57.2mm American pool balls. 1 x Dartboard with some darts. 2 x Cue rests (Spider & X-Head). 10 x 35mm Table Spots. 1 x Bottle of Aramith ball cleaner. 1 x Black plastic triangle. 1 x box of cue chalk. The Chevillotte Gascogne is available in an American 7ft or 8ft size. Please contact us for any details or advice on sizing. The Chevillotte Gascogne uses only the best Simonis cloth that is guaranteed to last for years to come. Manufactured in Verviers, Belgium, every cloth made goes through a 13 step process to ensure it is perfect, before being allowed to grace the market. Used in the majority of professional tournaments, Simonis cloth is renowned for its ability to prevent itself from pilling or fluffing. Its durability is what provides it with such an outstanding reputation, with this cloth you can be sure it will not need replacing for many years. As a true multi-purpose table, the Gascogne is available with a matching oak veneered dining top and oak Banquette benches. Chevillotte prides itself on operating since 1860 and manufacturing their exceptional Billiard tables since 1900. High quality wood including oak, beech, mahogany and high density fibreboard is selected from sustainable forests from Le Perigord (south-west France) based on its density and hardness. The wood is dried for two years before being delivered to the Chevillotte factory to ensure that it is in prime condition, removing any acoustic or vibration effects. Each piece of wood is selected and precision cut by machines and computers to ensure every section of wood is the perfect fit. Wood frames are trimmed to fit as the perfect foundation for the slate bed. Once fully assembled, the Chevillotte team use a specialist machine to level the table until the surface is perfectly flat, before fitting the slate. Diamond honed Italian slate is fitted into the wooden frame and bears a serial number to ensure they are kept with the correct frame built for them. Professional rubber cushions are specially glued onto the cushion rail and mounted in such a way that they are guaranteed to last up to 20 years. Chevillotte are one of the few suppliers in the world who have been able to master this difficult process. Each Chevillotte table is carefully assembled and hand finished in the workshop by experienced craftsman. All tables can be easily disassembled for transportation purposes if required, to ensure they arrive in the perfect condition. Each Billiard table includes a recorded serial number, which bears the Chevillotte trademark of origin and quality. A 10 year guarantee is included for every table purchased, proving the high quality and durability of these tables. You will find it hard to find a supplier in the industry that puts as much thought and care into their products as Chevillotte! There is little wonder they are world renowned for their high quality and stunning designs. 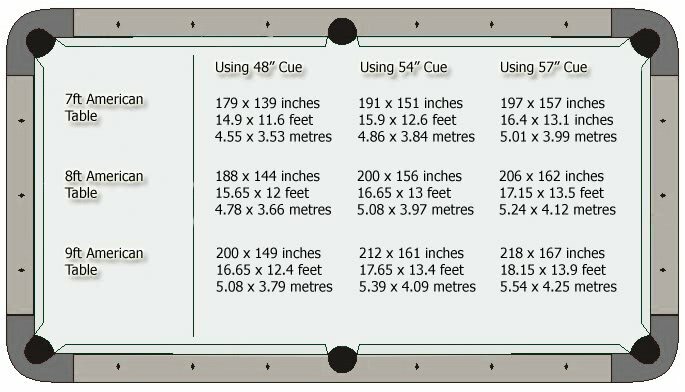 When choosing your pool table it's important to consider the size of the room or site you wish to place it in. Designed and exclusively manufactured in the renowned Chevillotte factory in France. Delivered and installed by qualified fitters (please see delivery information below). Can be used in the home & communal areas. Please contact our sales team for any help and advice you require for this table. Slate Bed Pool Tables are built to order. This process can take around 6 weeks depending on the model (please refer to product listing for more information). Once the table is ready it will be collected by our courier and delivered to the customer within the following 5 to 10 working days.